Fr. Mike Ausperk was born in Cleveland in 1962 to Dave and Ginny Ausperk. He is the oldest of 3 boys, both of his brothers are married and he has 1 niece and 3 nephews. Fr. Mike belonged to St. Gregory the Great Parish in South Euclid and attended elementary school there. He attended Cathedral Latin School and graduated from Brush High School in 1980. He graduated from Borromeo College of Ohio with a bachelor’s degree in Philosophy and Psychology. Fr. Mike then attended Saint Mary Seminary in Cleveland where he earned a Masters of Divinity degree with a concentration in Church Social Teaching and Social Justice. In 1989 Bishop Anthony Pilla ordained Fr. Mike and his 5 classmates to the priesthood for service in the Diocese of Cleveland. Fr. Mike has served in parishes in Mentor, Amherst, Stow, Cleveland and Wadsworth. 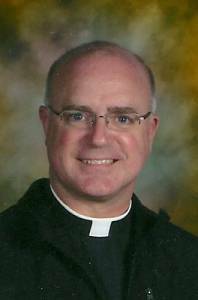 He is currently a Parochial Vicar at Holy Family Parish in Stow and Administrator of St. Anne Parish in Rittman. He serves on the Archbishop Hoban High School board of directors and has led a medical mission to Honduras for Holy Family Parish in Stow since 2006. Fr. Mike enjoys traveling, cooking and good meals with family and friends.